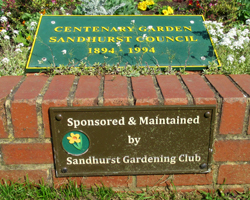 The Sandhurst and District Gardening Club was formed in 1963 and is the largest Club in Sandhurst, with nearly 400 members. We are a very active group meeting every month at the Sandhurst Community Centre. We also have a trading hut for members where we sell well discounted, high quality products. All are welcome at the club, whether beginner or expert. Please see our News and Programme Pages for the latest information and our next meeting and to download the latest newsletter. You are welcome to come to our meetings as a visitor on payment of a small fee. When you are ready to join please use the membership form on the downloads page. Results of the Late Spring Show can be seen here. Next Meeting: Wednesday 15th May at 7.15pm. Plant Sale and talk “Fruit growing in Pots” by Graham Talbot. The April 2019 Newsletter is available here. Sunday mornings from 9.00am until 10.45am. Wednesday afternoons from 2.00pm to 4.00pm until the end of June. The 2019 Price List is available on the Downloads page. The 2019 programme is available here. Details of Coach outings for 2019 can be found in the 2019 Newsletters as above, and also on the Club News page. Minutes of the 2019 AGM can be found on the Downloads page. This website has a page of links to other gardening related organisations. Please look in the News pages of the menu, or click here.